Heat oil in a pan. Add hing. Add the ginger garlic paste. Now add the ground paste. Cook it thoroughly till it leaves oil. Add the tomatoes, capsicum, beans, kashmiri red mirch powder and salt. Add 1 cup water and cook it with lid covered for 15-20 minutes. Make sure the beans are tender. Turn off the heat. 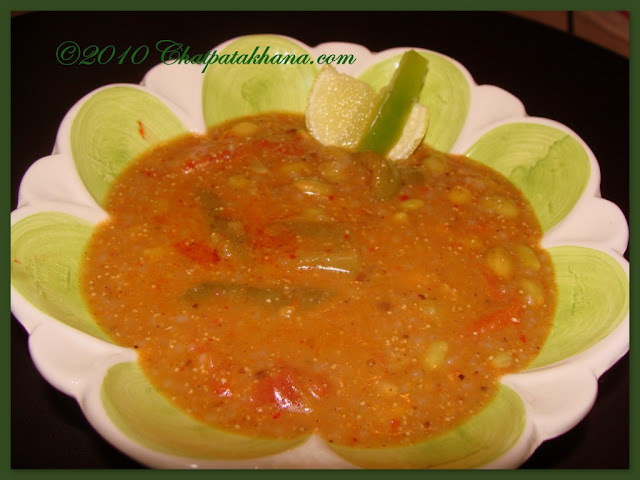 Serve with parathas or roti. You can add any other vegetables you like. WOW! That is looking so delicious! I will try this at home. Thanks for the recipe. This curry is looking delicious! I'd love to try this at home. Thanks for the share! Thanks Sarah and Gabby ! I didnt add the chickpea flour, used real chillie. It was very good. Will make it again. Sounds delicious! I'd love to try them out. Thanks for the share! Thanks for the recipe, will be back soon.